Eibach, a name synonymous with suspension tuning excellence. 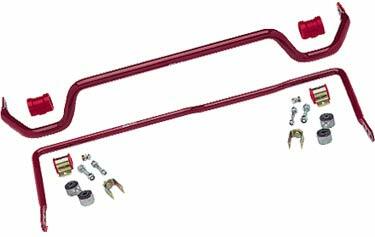 They could have just made one two or maybe even three sway bar kits for the E36, but in fact Eibach produces no less than 8 kits, Wow! VAC, through our relationship with Eibach, has witnessed the testing of their product side by side, in person, with competitors products. The results were clear: when it came to production quality and resilience of failure or deformation of material, Eibach was the clear winner. Eibach's Anti-Roll Kits reduce body roll through increased design stiffness over stock bars. The result: increased handling, cornering grip, and confidence in any performance-driving situation. Manufactured from cold-formed, high strength aircraft-grade steel for precision performance, and finished with a long-lasting red powder coat finish. Most applications are 2 to 3 way adjustable for roll resistance to easily fine tune to your personal liking. "The Anti-Roll Kit comes complete with all necessary mounting hardware and instructions for easy installation."